Whatever will they think of next? That’s the great thing about upcycled furniture - you can let your imagination go wild and produce furniture that is a more a work of art and an original statement akin to the retro styles of the 60’s. 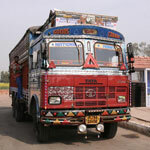 And this Indian Lorry Bar is a great illustration of this. Genuinely upcycled by hand from decommissioned lorries in India you can see from the picture that this particular one is made from the familiar TATA company lorries. And it’s great to see them live on and serve other practical purposes instead of just being scrapped. Each one, of course, is totally bespoke and has the wear and tear of the particular vehicle used which adds to the character and appeal in much the same way as our reclaimed teak furniture. The original number plate is still in place as well - another bespoke and unique feature for you. The headlights on the lorry still work making it great for use at night as both a table and an outdoor light round a BBQ or Home Bar Set. And it will certainly pull a few heads with friends and family or the punters in a commercial environment - no doubt about that. The tabletop is smoothly hand finished from reclaimed timber with a Lime Wash for aesthetic appeal and to offer a bit of protection when used outdoors. Obviously, the decommissioned truck body will remain largely unaffected by the elements and easy to wipe down. It’s also on wheels anyway so moving it really isn’t a problem. Please note this Lorry Bar comes in a Large Size, and Smaller Size. Please speak with our Sales Team in the Midlands for further advice.